A great quality option for most 27 inch wheels. The Panaracer Pasela is well equipped for trips around the block or across town with a ridged tread that rolls great on pavement and hardpacked trails. 27 Inch. (630 ISO). Available in various widths. Wire bead. Black/Tan sidewall. The tire fit and looks good on my 1975 Raleigh. The Pasela is my go-to tire for use on vintage road bikes. With a supple tread and sidewall the ride is very smooth and fast while still having huge grip on all surfaces unlike the typical replacement tires with the raised 14 wide center rib. I have used these tires for comfortable century rides and by lowering the air pressure I have used these in shallow mud and sand covered trails. On one memorable trek I was with another cyclist who was riding an expensive mountian bike. As we started up one steep, washed out road, the mountian biker hopped off to walk while I was able to power to the top on my touring bike using these tires and my rat trap toe clips!!! If you like your vintage machine you will love it with Pasela's! Good Fit. Super supple side walls. Good dynamo track. Decent tread for road riding, but would prefer something smoother. I used these tires to replace the old and cracked Kenda's that were included on my vintage 80s Japanese Miyata. I bought these because the Panaracers are also manufactured in Japan, and the number of people noting the quality of the tires. I use these on the streets of Chicago for a 20 mile commute (mostly Clyborn to the Loop). One tire even survived a small piece of glass that punctured the tube, this was about 2 weeks after installation (bad luck). Wasn't much damage to the tire, so I installed a new tube and haven't had any problems. 3 months in and they are weathering the tough winter very well, haven't had any flats either. I try to keep them as clean as I can, but the gumball sides have tarnished a tiny bit... just too much salt and grime on the roads this horrible winter. Pretty good grip in the snow and rain for a thin tire. Haven't been riding 27" long enough to know of the apparent shortage in this size, but I appreciate that quality tires are still out there. I'm saving up to buy another pair just so I have some great tires as a backup. Great fit and goes on unbelievably easy. It looks great and it's a great value priced below $30. Would buy again, and definitely recommend this tire to anyone. I bought these for the 2017 Cycle The Erie Canal tour. Using my road bike as a touring bike. These tires have a tread, which my Continental Gatorskins did not. Good thing because heavy overnight rains produced a lot of muddy spots on the trail. The Panaracers were okay in the much and rolled very fast on the road sections of the trail. 7 of 13 customers found this review helpful. My complaints are not with the performance of these tires, but with the asthetics. The transition between the tan and black sections of the tired is uneven around the circumference of the sidewall, like icing on a doughnut. Not what I was expecting when I ordered. Makes the bike look sloppy and as old as it is. This is the second pair I've gotten for my touring / winter commuter bike. They are very easy to install and have a nice, classic look. A quality tire at a nice price, also seem to be very durable. I will buy them again. Excellent tires, great price, fast delivery! 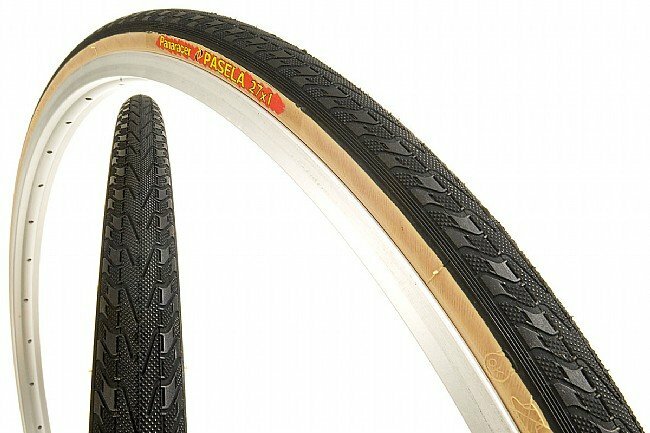 Best tire value for vintage road bikes. Well made, light weight, good looking. I use the 27 x 1 size, which need narrow rims, but they are as lightweight and fast as 700 x 25. I bought these tires based on earlier positive reviews by others and have little new to add other than to state I hope these tires remain available for those of us who still ride 27 rims. They have performed perfectly on a commuter bike I built from a 70's Atala steel frame and a good wheelset laced with Wolber alloy rims. Inflated to 110 psi these tires hum sweetly on the blacktop, roll fast, and provide a comfortable and responsive ride. After nearly 1000 miles on pavement the tread is still great. And with Stan's in my tubes I've had no flats despite our prevalent thorns. I could ride any one of three better bikes for my commute, including a titanium-framed beauty rolling on sew-ups, but I end up riding the bike wearing these tires 90% of the time. These Panasonic 27 x 1.125s are great. I was concerned about the width, as I was replacing 27 x 1s, but the extra 18 is barely noticeable. The tires fit my wheels perfectly and I am very satisfied with the 115 psi suggested inflation. The inflation along with unidirectional tread makes for great glide distance. Good looking as well. Great tire. Love the gum wall look. Replaced ten yr old tires on my 28 yr old Cannondale. Holds 105-110 psi with no problem, and they are great in the rain and bumps. 500 miles on them. The rear tire is balding but, hey, 500 miles! I was so pleased with them that I bought two more and stored them in air tight container for when it came time to replace just in case they stopped offering them. Only two flats, both my fault. I use the Continental TOUR tube and they hang in there quite well. The gumwall cleans real easy and looks great among all the high tech hardware everyone else is riding on. Even fellow riders tease me in a good natured way about my gumwalls. I love this tire. Going to get a couple more. I would definitely recommend this tire. If you have an older road bike, these new 27 x 1 tires are not the same size as the vintage 27 x 1 tires, even though the ISO numbers are identical. They are nearly 1 cm taller and they do not clear the brakes on my 1987 Centurion Accordo. In fact, no new 27 x 1 works for this bike any more. So keep this in mind if you have a vintage bike with little brake clearance. I've had to scavenge some older Avocet 27 x 1 tires to keep my bike going for now. The return process was very smooth. If you have a bike that was built before terms like hybrid and composite were used to describe bikes , than your bike will probably love these tires. Basic Old School tread baby. Straight out of the seventies, these tires are the real deal. If you have an old Peugeot, Fiorelli, Fuji, Raleigh or Kabuki this is the replacement tire no doubt. New rubber for your old love. Good tire until you hit a 3 inch tall lip. It does get punctured every once in a while, but thats to be expected on country roads. The main con for me is that if you put sealant in it, it voids the warranty. Which is fine if your tire doesn't get a tear in it from hitting something. I hit a 3 inch lip going about 15-20mph, my tube popped and I later found a tear in my tire, since I used a sealant, I had no warranty for a possible manufacturing error. I had a 27x1, and later that day I got hit by a car so I haven't bought another one yet due to some damaged parts. I do like this tire though. It gets very good grip and is great overall. I used it on an old, original Schwinn I received from a friend. Great looking tire on my '73 Raleigh Super Tourer, and comfortable. This is a great looking tire on my '73 Raleigh. It was very easy to install with the wire bead, and a comfortable riding tire. What a sleeper! This tire is shaped very much like the latest motorcycle racing tires and really grips in the corners. Braking grip is also excellent. The medium price might suggest medium performance - not so. This tire is a great value.